As with economic growth, Facebook growth has its limits. 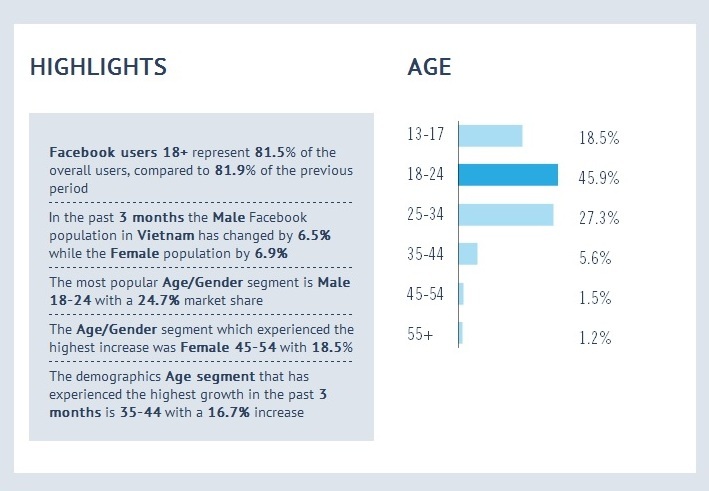 After phenomenal increases in recent years, it looks like Facebook (FB) use is beginning to plateau in Vietnam. In a country with a population of 92 million and an Internet penetration rate of about 40%, it was inevitable that this segment of the social media market would begin to mature. As I wrote in a January 2014 blog post, there were over 22 million FB users, twice as many as the previous year. As of last week, that figure had jumped to 24 million, which means that 65% of all Vietnamese netizens and 26% of the entire population is on Facebook. That’s extraordinary in a country with a 2013 per capita income of just under $2,000. The current gender distribution is 55.2% male and 44.8% female and the most popular segment is males between the ages of 18 and 24. The chart below has additional information, including the fact that the age/gender segment with the highest increase was females 45-54 and the age segment with the highest growth in the past three months was 35-44. Below are the top 15 Facebook fanpages number of fans, sector, etc. as of two (2) weeks ago.